TAINE has been founded in 1993 as a consequence to Andy's wish to have a "100% metal" band, as he was influenced at that time by well known bands as Megadeth, Metallica, Iron Maiden, Mekong Delta, Carcass, Coroner, Cynic, Atheist, Death and many others. The idea of founding "Taine" band had been actually materialized with the enormous indirect influence of Megadeth. Being a fan of this band, especially of Dave Mustaine, Andy had at the time all the walls covered in posters with Megadeth' members. So, one day, searching for a revelation or a epiphany that could help to put in place his dream of having a metal band, he saw the picture and the name of Dave MusTAINE, and that's how "Taine" denomination appeared. The last syllable of Mustaine's name-TAINE-has a deep, esoteric meaning in Romanian. In Romanian language, Taine is a polysemantic word and most of its means are related with the Orthodox Church belief in the 10 mysteries. The story has begun with the "cooptation" of 13 years old kid named Ady Tabacaru to play drums and Stefan Aldea at guitar. Andrei Nicolescu, playing bass, has joined the band several months later and the rehearsals begun and they composed their first songs. Meanwhile, there has been set up a gang of few bands from Bucharest, namely CRONOS, ABIGAIL, INVERS and PLUTONIUM together with Taine and sessions of concerts in Romanian capital have begun. The songs "DESTIN","THE END","CONFUSSION","SECRET PLACE", "REPENT!" were composed at that time. These songs were recorded on rehearsal room During the years 1993-1994 and the first demo tape, titled "DESTIN" has been completed. Thanks to the TV producer Petre Magdin three of the compositions had been recorded in television in 1994 to be broadcasted on a TV show dedicated completely to rock and metal music on the National Television (TVR1), "Intalnirea de la miezul noptii"
Furthermore, Adrian Tabacaru became one of the most praised percussionists from Romania in spite of his youth and gained many awards of his own. This was one of the reasons that determined his later choice to complete his studies at "Dinu Lipatti" Secondary School of Musical Studies and after that at " Bucharest's Music Academy "Ciprian Porumbescu"
Finally, in 1996, they recorded another two songs in the same demo conditions and they were added to the 7 ones written above alongside an older one. Those are "Vanity", "Love and Hate" and, respectively, " Secret Place". This was the final form of a recording become a sort of official DEMO-TAPE titled "CEALALTA PARTE". The songs "Woman" and "Ce esti tu?" has been recorded on "B'inisor" studio in 1997. "WOMAN" was included on the first Romanian "metal" compilation named "Underground Romania Rock vol. 2"and produced by "East & Art". During the years 2001-2003, Taine has managed to break the barriers of an Eastern European country, being one of the few local bands-if not the first of them- appreciated on the Western musical market, and had some successful concerts abroad, in Germany during the festival "Tribute to Monsters of Rock" and France, at FIMU Festival. On the spring of 2003 the band shot their first video-NO PERSONALITY- with the support of the PR manager Andy Ionita. The video was firstly broadcasted on MTV Romania. These achievements were followed by many concerts in the country and few of them even abroad, in France and Germany and, in December 2003, the climax is reached with their performance as the opening of KREATOR's concert at Sala Polivalenta from Bucharest. 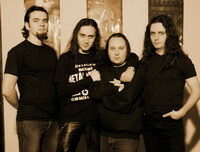 Moreover, during the last year the band was strongly promoted by MTV Romania and other Romanian music televisions, which have often broadcasted their videos and interviews. As a consequence of the increasing interest in the band, Taine produced their second video clip-INGER SAU DEMON. This video can be also found on the first compilation on DVD on the Romanian market, produced and distributed by Heavy Metal Magazine. At the time being the material for a new album is prepared-the songs being already mixed and soon to be mastered somewhere abroad -- and for the DVD, material that will introduce the band's history , "DECADE OF METAL"-the ten years past in the service of metal. Taine's DVD has been finally launched on the last decade of March, 2006 and made up the first product of that type released on the national underground scene of metal. It is currently almost completely sold-out. A new video for the song Love & Hate should be also released soon. After 10 years of playing with TAINE, Bogdan Visan has decided to leave it without any explanation in the summer of 2005. He invoked some personal reasons but never offered any details. Shortly after leaving the band he announced that he would intend to rise again his former band "CRONOS". He was immediately replaced by a young and promising bass player - Robert Pieptan (SEP) who had been playing with another band, "Avskild" but he continued co-operating with both bands, trying to do his best, the highest moment coming with the opening for "Obituary", when he played twice that evening. He recently gave up playing with Avskild because of some personal reasons, too.